PM 9 (pictured above), which currently has the capacity to produce 400,000 tonnes per year of coated mechanical papers, will be rebuilt to produce recycled liner and fluting grades with an annual capacity of 600,000 tonnes. Aug. 27, 2018 - Valmet will supply an extensive paper machine grade conversion rebuild and a wide scope of automation for Burgo Group S.p.A. at its Verzuolo Mill in Italy. In the project, originally Valmet-supplied paper machine PM 9 and related stock preparation systems currently producing lightweight coated (LWC) paper grades, will be rebuilt to produce recycled containerboard grades. The value of the order will not be disclosed. The total value of an order of this type is typically around EUR 40-60 million. The project is following Burgo Group's plan to keep the focus on containerboard grades and to continue its diversification strategy, ranging from publishing to packaging, from printing paper to paper for corrugators. The start-up of the rebuilt machine is scheduled for the end of 2019. "Valmet and Burgo have had a long and successful cooperation over the years at the Verzuolo mill. By having all the process equipment, process automation and mill engineering from one supplier, binds it all into a one. This assures a very good flow of information, a reliable project schedule, short installation time and an energy-efficient operation. Valmet's long expertise on grade conversions is essential for this project. 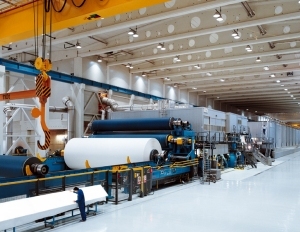 It is also a great asset for Burgo, that this paper machine was originally supplied by Valmet in 2001, so we know it well," says Jari Vähäpesola, President of Paper Business Line, Valmet. Valmet's delivery includes a completely new Old Corrugated Containers (OCC) line and major modifications in the existing paper machine. The OCC line, which is called an OptiRefiber recycled fiber line, contains two bale handling and vertical pulper systems, extensive cleaning and screening systems with fractionation and disc filters for short and long fiber lines. The scope includes also new reject handling system for OCC rejects. Also, the existing broke system and approach flow system are modified. The delivery in the existing paper machine includes a headbox rebuild, modifications to forming section, press section and pre dryer section, a new after dryer section with a high humidity hood, modifications to the size press, a continuous cooking system for surface size starch, and relocation of the existing reel. The delivery also includes related air systems, a large Valmet paper machine clothing package, and changes and improvements in the automation including machine control, quality management, and process control and condition monitoring systems. The delivery includes mill engineering for both the OCC line and board machine. All the equipment will be delivered with installation and an additional production support package after start-up. PM 9 will be producing recycled liner and fluting grades at a trim width of 9,800 mm and with a basis weight range of 70-160 g/m2. The annual capacity will be 600,000 tonnes. Burgo Group is one of Europe's leading producers of graphic and specialty paper. The Group employs 3,663 people and has 11 plants in Italy and 1 in Belgium, and in total 16 continuous machines. In 2017, Burgo Group produced 2,057,000 tons of paper and had a consolidated turnover of EUR 2,008 million.